A racist slur was found at the African Burial Ground National Monument over the weekend, sparking outrage and devastation. Wale Aliyu reports. New York police say a racial slur defaced a historic burial ground where the city's blacks were once laid to rest. 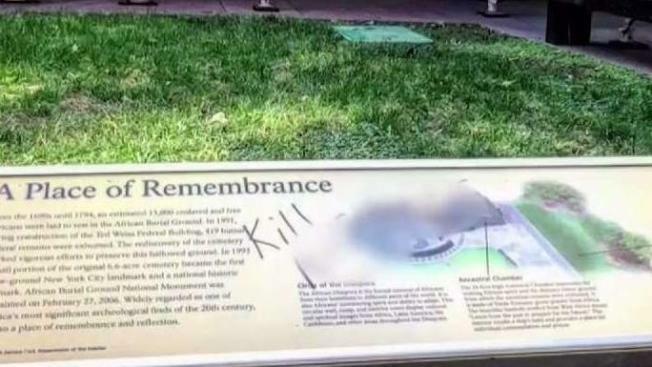 The offensive graffiti suggesting African-Americans should be killed were under investigation Friday at the African Burial Ground National Monument in lower Manhattan. The New York Police Department chief of detectives, Dermot Shea, says the words were discovered on Thursday. Police answered a report of the racial slur scrawled on a monument plaque. The NYPD Hate Crime Task Force is looking at footage from security cameras in the area to try to find the perpetrator. Thousands of skeletal remains from the 17th and 18th centuries — many of enslaved blacks — are buried at the site. At the time, they were not allowed to be interred in traditional cemeteries.